I have loved this test ever since I first saw it, and I’m not even sure when that was. 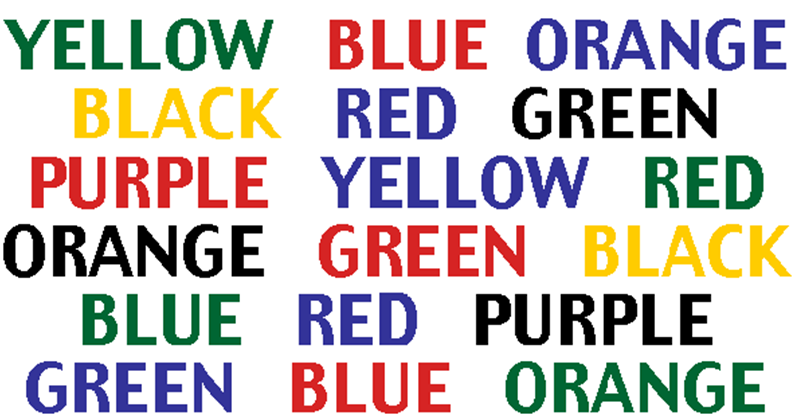 Well, apparently the right half of your brain is trying to say the colour, while the left side of your brain is trying to say the word. Have someone read this to you, first have them read the words (that’s not too hard), but then have them look at the words again, and not say the word, but say the colour of the word. Yellow, Blue, Orange, Black, Red, Green, Purple, Yellow, Red, Orange, Green, Black, Blue, Red, Purple, Green, Blue and Orange.